Think of Eureka's Casper as an economy-class sleeping bag with higher aspirations. At roughly 1/4 the price of a high-end down bag, the Rteq™ synthetic 15°-rated Casper is designed to be light enough to carry and warm enough to be worth carrying. Backpacking-oriented features include a standard-size, fully-closeable mummy shape, a soft, slightly-textured polyester lining, a trapezoidal foot box, a full length-draft tube, competitive compressibility, and of course the Casper's 3-pound, 1.5-ounce weight (measured, without stuff sack), which places it well within range of comparable (but more expensive) synthetic bags. I find myself at little bit at a loss when it comes to placing the Casper in its proper context, as I can't fairly compare it to, for example, one of my $400 down bags. Still, the Casper's build quality appears reasonable—clearly not top-of-the-line, but also clearly not bargain-basement. The YKK zipper, for example, looks durable and works smoothly. The stitching is generally though not flawlessly even, as is the insulation distribution. Eureka has not achieved a manufacturing miracle here—as I say, the Casper is economy-class gear—but what you get for your money, as far as I can tell, is of good value for the price point. The one exception to that might be the temperature rating. I think the Casper is a little over-rated as far as warmth. My tilt would be that this is more a 30 or even 40° bag than a true 15° performer. Many manufacturers (like Marmot) are switching to the more objective EN-certified testing system to determine temperature ratings. That is not the case with the Casper. Spending a night in the Casper during an unexpected cold snap, I was definitely on the cool side. To be fair, I awoke to find my nearby water bottle partially frozen, so it was a cold night, but I remain reasonably confident that the Casper is not as warm as my premium 15° down bags. Just a simple loft comparison reveals that my down bags have a lot more trapped air space. 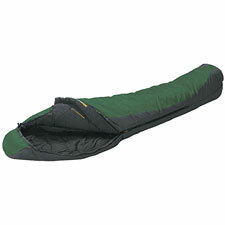 In addition to weight, one of the primary liabilities of synthetic sleeping bags has been compressibility. In this regard, the Casper is quite an admirable performer, squashing down to not quite the size of a Marmot Helium, for example, but easily the size of my North Face Hot Tamale—maybe even smaller. As I say, however, the Casper doesn't seem quite as warm as either of those bags, so you are to some extent trading away warmth for weight. Who will the Casper appeal to? Certainly any price-sensitive consumer wanting specifically a synthetic backpacking bag should give the Casper a look (and perhaps also browse the comparable REI-brand models for comparison). Car-campers in mild climates would also be a good match. That said, for only a bit more money, low-end down bags become an option, likely offering the general backpacking crowd a decidedly better warmth-to-weight ratio.